Norbulingka Dharamsala, Discover Tibetan Art & Craft, Study Tibetan Culture, Volunteer Services,Buddhist OM,Tibetan Homestay Dharamsala,Dharamsala,Dharamshala,Sightseeing Dharamshala !! The Norbulingka Dharamsala the Institute of Tibetan Culture was founded by the Department of Religion and Culture to preserve and promote Tibetan Art and Culture in exile. It derives its name from the His Holiness the Dalai Lama's beautiful summer residence, the 'Norbulingka' (Jewel Garden), set in parkland two kilometers from Lhasa. Fearing for the future of Tibet's cultural heritage, the Seventh Dalai Lama, Kelsang Gyatso, established institutes of arts and science there in 1754. Today, with occupied-Tibet undergoing the bleakest period in its history, the Norbulingka Institute in Dharamsala has taken the initiative to preserve the roots of Tibetan culture in exile. The institute is sited in a scenic valley below Dharamsala. It also includes a Centre for Higher Tibetan Learning. When you come to Dharamsala along with the Budhhist OM chants you must visit this Tibetan Art and Craft Institute as an important part of your Sightseeing Dharamshala..! The Buddha..has been an inspiration of Buddhist Art all over the world. After the Buddha’s death those who knew him began to make icons of his liberating presence, although at first it was considered that no human representation could do justice to his memory, so that symbols such as the wheel (of the Law), or the trees (of spiritual enlightenment) were used. By the time Buddhism came to Tibet in the seventh century AD, however, the artistic expression of the Mahayana, or Universal Vehicle, had reached considerable heights of inspiration. Sakyamuni Buddha, various cosmic Buddhas, magnificent female and male Bodhisattvas, all were portrayed in splendid paradise-like settings. 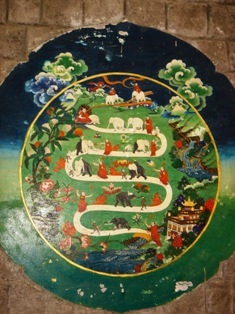 The earliest surviving Tibetan images date from the ninth century AD, and from that time until the present a wealth of magnificent painting and sculpture survives which has served both as the focus of meditation visualisations for many generations of Buddhist adepts, as well as educational illustrations for ordinary Tibetan people. Today, there are probably many more beautiful Tibetan works of art in Western museums and private collections than presently exist in Tibet. 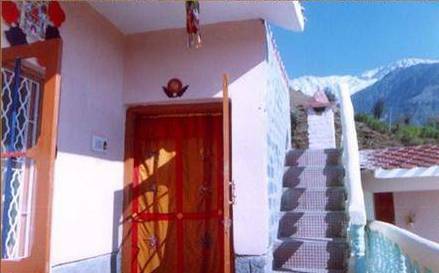 The best way to experience Tibetan culture in Dharamsala is to stay in an Tibetan home..Vidya Niwas..! Tibetan temple wall paintings still exist, however, both in Tibet itself (Tsaparang, the Gyantse Kumbum), in the Tibetan cultural areas of Indian Ladakh Alchi), and Himachal Pradesh (Tabo), in Nepal (Mustang) and in Bhutan (Paro Dzong). 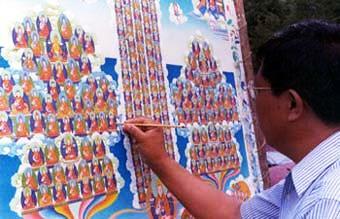 However, the painting medium best known outside Tibet in Norbulingka Dharamsala, is the 'thangka', or scroll painting. Usually painted on cotton cloth, more rarely on silk, colours are traditionally made from minerals as well as vegetable dyes. These ‘stone’ colours maintain their intensity so well that many old thangkas still retain striking colours. 'Thangkas' are traditionally mounted in frames of silk brocade with a pole or batten at the top and bottom so that it can be easily hung. Itinerant lamas used them as icons of personal devotion and to sanctify tents in which they hold Buddhist teachings. In most Tibetan homes the thangka, together with small bronze images, is an integral part of the family altar and a vehicle of visual 'dharma'. Manuscripts are often adorned with miniature paintings, as are their wooden covers, and sets of initiation cards, called 'tsakali', which are another medium of miniature painting. Metal, clay, stucco, wood, stone, and butter are all used in the creation of sculptural images. The best known of these is metal, since small, portable, bronze images of a great variety of meditation deities are most frequently encountered. Clay and stucco have been used since ancient times, particularly in the creation of very large images installed in monasteries and temples. Works of art are usually commissioned, either by monasteries or lay patrons, and their execution generally follows strict canonical rules as to proportions, symbols and colours, in accordance with artistic manuals. Tibetan art is largely anonymous, and this custom of artistic anonymity is grounded in the Buddhist belief in working toward the elimination of the individual ego. The Tibetan attitude to a work of art is that when it is successfully completed it has an existence of its own and an inherent power to help the viewer come to spiritual realisation. Wood is widely used, intricately carved for entrances to temples and for interior pillars and in covers for scriptures in monastery libraries. This ancient craft grew from the monasteries and filtered down to the public. 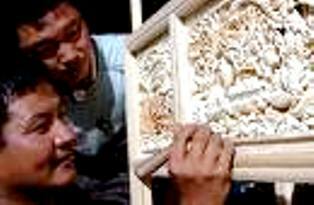 Norbulingka in Dharamsala, trains currently young workers in the art of wood carving. The form given to a painted or sculpted image follows a clear and well defined iconography set out in the appropriate texts, whilst artists’ manuals illustrate the strict measures to be observed in achieving correct proportion and balance. 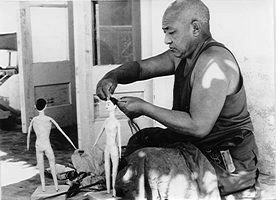 The Tibetan artist, like his Indian counterpart, is not free to improvise on his personal concepts of the appearance of an individual deity but is required to work within a well defined structure. In the tantric art of Tibetan Buddhism, benign, wrathful, serene or terrifying deities all illustrate an aspect of the Buddha mind, or the potential to be found in each of us, so that the artist projects for us archetypal images from deep within our subconscious, inviting us to contemplate those aspects of our being which usually remain hidden. For the meditation practitioner, such images are models for the process of visualisation, where the adept develops the ability, through stabilised concentration and cultivated inner vision, to visualise the deity in all its phenomenal detail and then absorb this vision into him/herself and so absorb the spiritual qualities particular to that deity. 'Losel', is the ancient art of making dolls which started from the monasteries. The monks were trained in the art of doll making. Other decorative art were the silk brocades and richly worked robes, pearls and precious stones, ritual vessels and incense burners, gilt images and lacquered goods. Tibetans produced earthenware, often of fine quality. The Tibetan love of exuberant decoration resulted in everyday items being produced with wonderful embellishments. 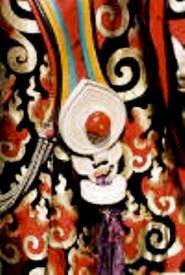 Nearly every item used by Tibetans was fashioned in this highly decorative way. Ink pots, tinder pouches, knives, teapots, storage vessels, all were decorated lavishly in characteristic ways. Tibetan artisans are skillful people, and they have long produced large quantities of ornate and intricate silver and gold jewellery, often set with coral, turquoise and other precious stones. Carpet weaving for domestic and monastic use is another ancient craft, and carpets are popular products from refugee communities even today. Carved and painted wooden tables and cabinets are still in high demand as are silver lined wooden bowls for butter tea. Crafts and decorative arts enormously enriched Tibetan life and penetrated all levels of society. For more on Norbulingka Dharamsala...Go to Dalai-Lama-Dharma !